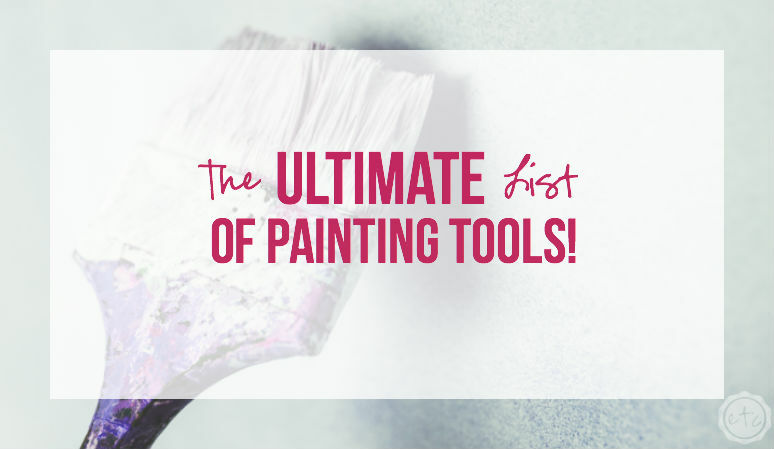 The ULTIMATE List of Painting Tools! - Happily Ever After, Etc. 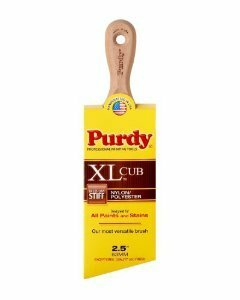 The ULTIMATE List of Painting Tools! With great paint comes great responsibility… or great tools… or a great amount of confusion? Painting looks so easy but there’s this brush and that roller and how do you know what to pick? In the world of painting tools you need a guide and I’m here to tell you all of my favorite tips and tricks… day in and day out these are the tools I recommend to each and every single customer at my Sherwin Williams store. They’re the same tools I used to paint my own home… so you know they’re good! 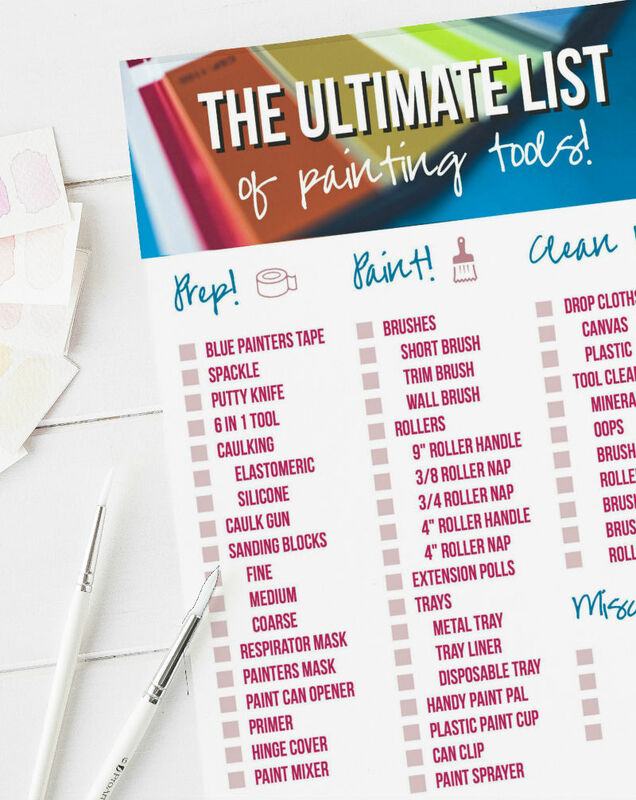 This is the master list… every single tool I could possibly think of to take you from prep to paint to clean up. If you’re looking for a short list check out the 5 tools I would totally splurge on if I was building my painting arsenal from scratch! Here’s the master list… complete with explanations and pictures! Of course if you’re headed out the door (or you just want a short comprehensive list) go ahead and scroll all the way to the bottom… I’ve put together a FREE printable checklist for you! 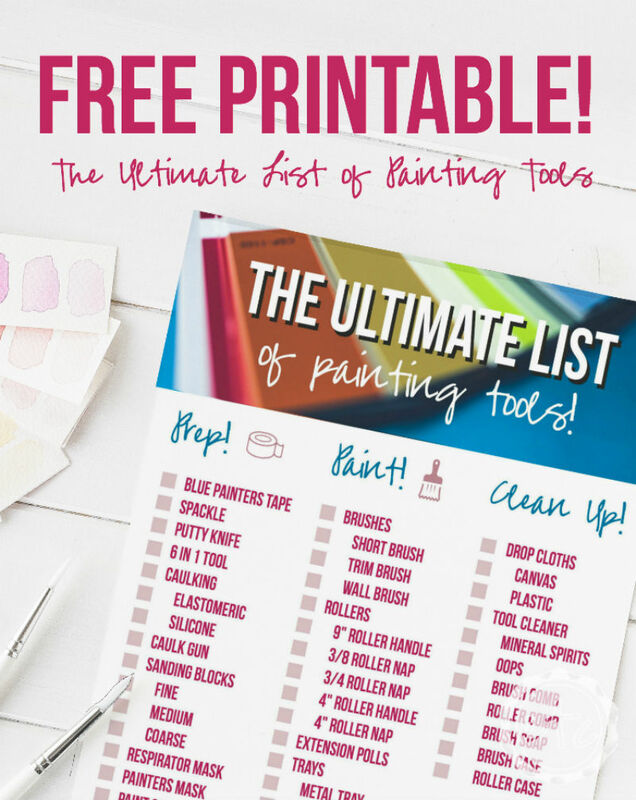 Scroll down to grab your free list of painting tools… that way you won’t forget a single thing! Looking for a bunch of posts on painting? I’ve got you covered! Click here to see all of my helpful paint posts in one place! Remember how Dad always said measure twice cut once? Well the same concept applies with painting… for a great paint job start with good prep work. If you can cut in a room like a pro you might not need painters tape… but if your hand isn’t quite steady painters tape will be your best friend. The secret to a crisp clean line? Sealing those edges! Place your tape and then go back over the edges with a spoon or your fingernail… make sure they’re sealed tight! People are always so scared to put holes in their walls “I can’t hang pictures I live in a rental!” Just remember y’all spackle dries in like 5 minutes! In thirty minutes you can sand and paint that sucker… make your home your own and invest in a little tube of spackle like this guy. 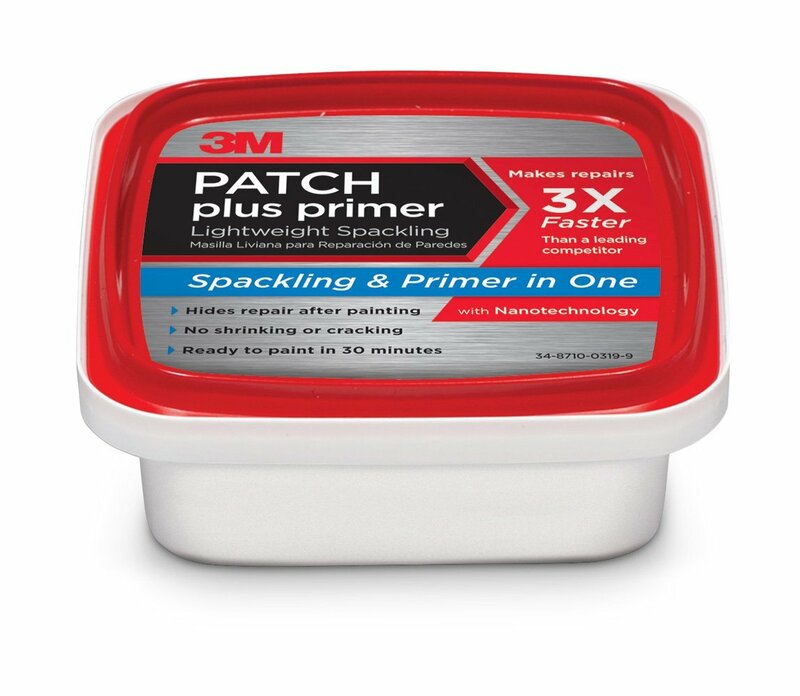 It has primer built right in so your spackling is quick and easy! Now I’ll be honest I use my finger for a putty knife… spackle doesn’t bother me a bit. However if you have a ton of spackling to do (like when we moved out of our last house) or you just don’t like the feel of spackle a little putty knife is nice to have. 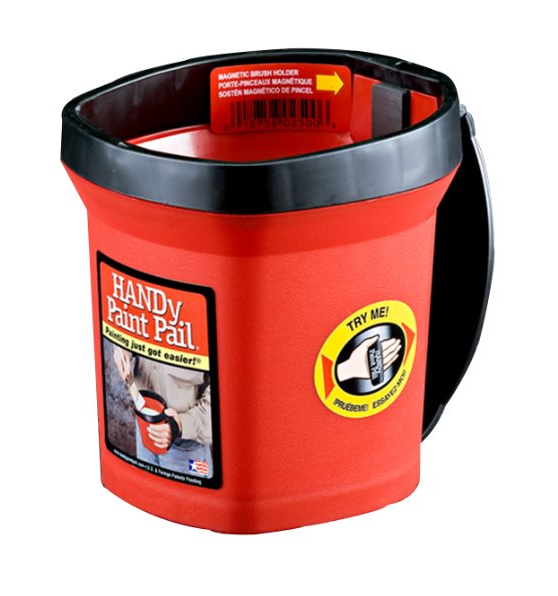 This little guy is pretty much the do it all tool: scrape paint, peel wallpaper, open paint buckets, hammer nails, clean roller naps… who knows what else you could use this little guy for. 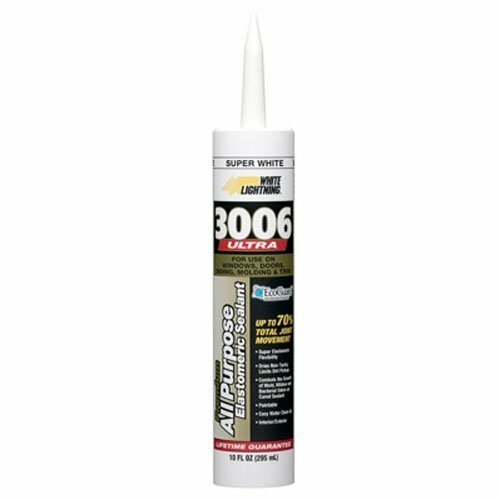 In the world of caulk there are two main variety’s: elastomeric and silicone. Elastomeric is more flexible (think 40% flexibility vs 4%) and therefore does not crack quite as readily as silicone… of course that means it’s more expensive. Typically elastomeric is great for hardy board or crown molding… places where your joints will expand and contract with heat/cold the most. 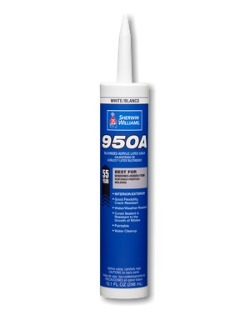 Silicone caulking is your bread and butter… it’s perfect for most jobs. 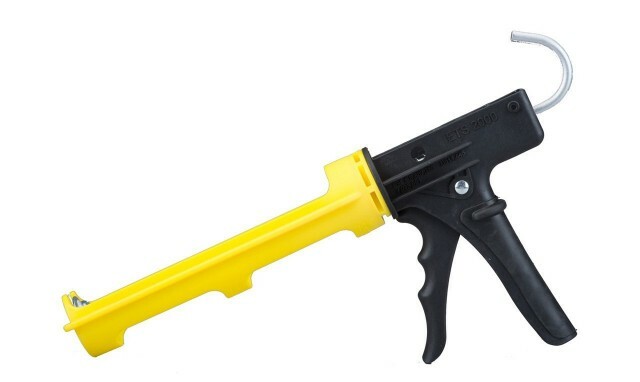 Of course if you’re using caulk you’ll need a caulk gun. I love this drip-less yellow one… because it’s drip-less ;). 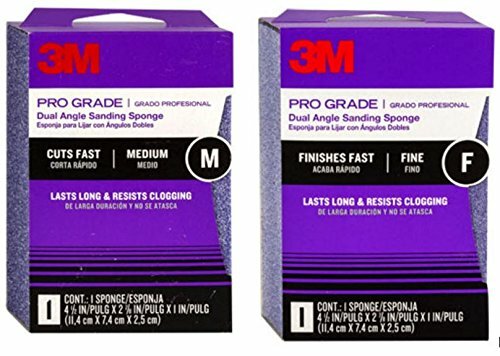 Sanding blocks are great if you aren’t sanding a huge project… they fit perfectly in your hand and will last through many projects. 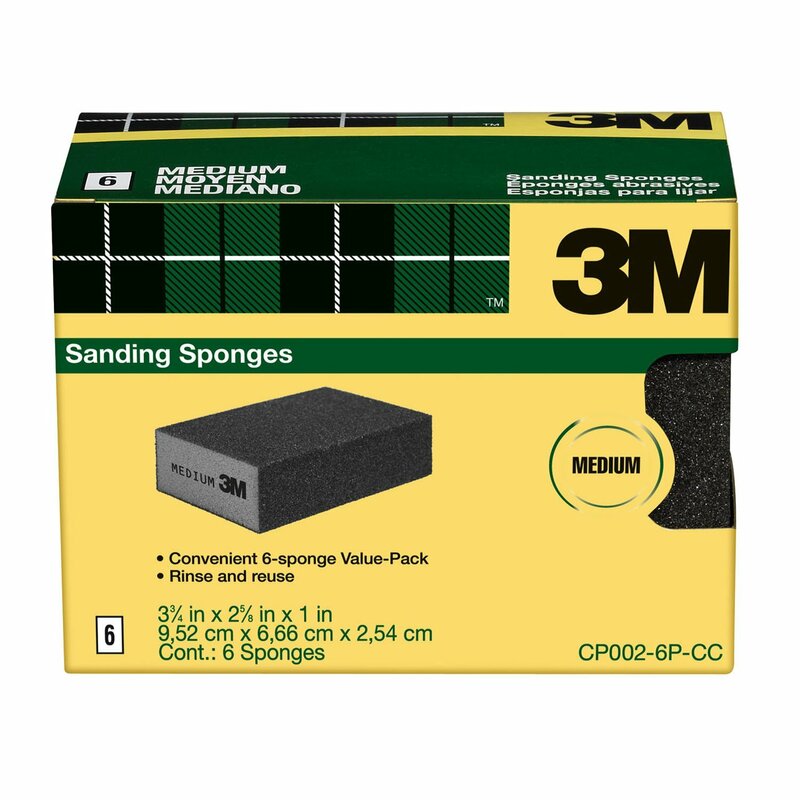 Depending on your project sanding blocks are available in fine, medium and coarse. As a girl who grew up cutting pieces of sand paper and trying to hold them around a block of wood (just like Daddy taught me) sanding blocks are a dream… so much easier to use! Y’all can figure this one out. 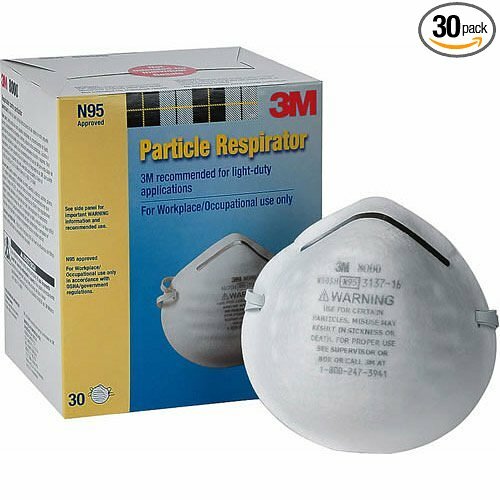 If you’re working with a super smelly paint (oil based or solvent based are the smelliest) then you may want a respirator. Especially if you know you’ll be working with a smelly paint frequently… for painting cabinets or furniture perhaps? 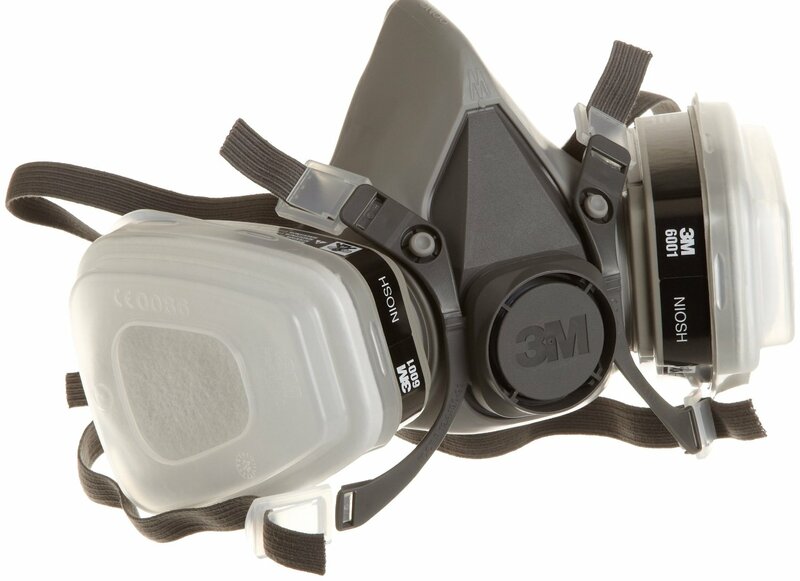 If you’re only working with smelly paint for a limited time one of these little painters masks might just do the trick. Typically you can buy them one at a time or in a large pack… girls night in? When a screwdriver just won’t cut it spring for a little can opener… they’re awesome! I know I know I know… paint and primer. Want to know a secret? 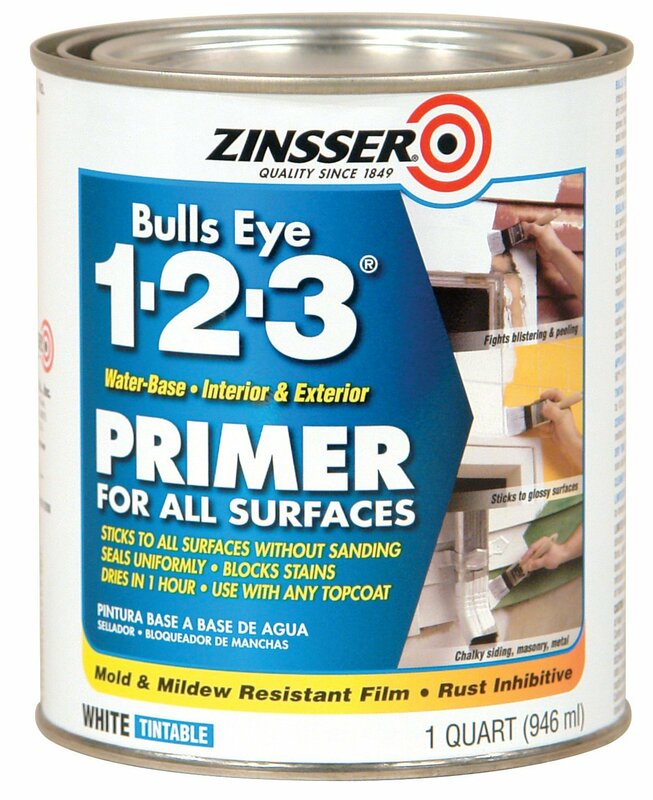 Paint and primer is really just thicker paint… nothing beats a great layer of primer. 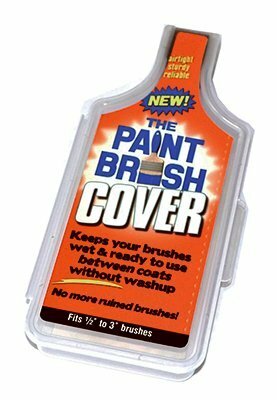 If you want your paint to look truest to color? Primer is the answer. If you want to make sure your paint sticks to the wall? Primer is the answer. If you want your paint to last for years? Primer is the answer. It takes longer but trust me… primer is the answer. 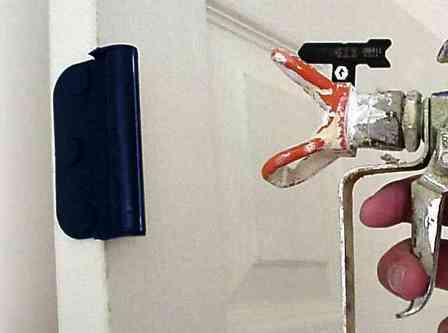 These little babies are a trick I learned from my very first paint store… instead of taping off every single hinge in your home invest in 3 or 6 hinge covers! They snap right on and make painting your doors a snap… plus they’re super easy to clean so you can use them again and again. This little guy is awesome… it fits on the end of a drill and makes stirring paint a snap. If you’ve ever stirred a five gallon bucket of paint by hand you’ll be thankful for this guy… trust me. 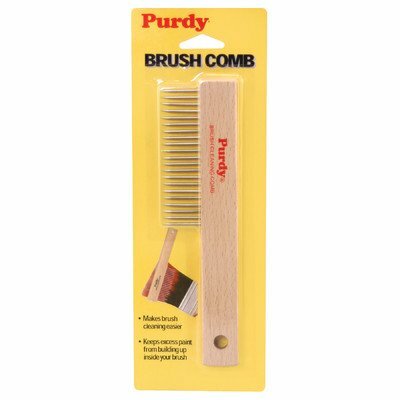 All brushes are not built equally… which anyone who’s ever painted a cubby hole knows. We learned the hard way when we painted the hubby’s desk that a tiny cubby hole works best with a tiny little short handle brush. 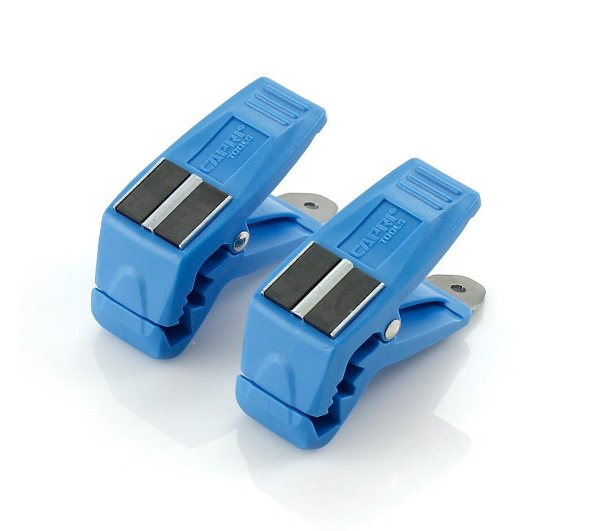 These guys are also great for cutting in tiny areas… like in between tiny molding. 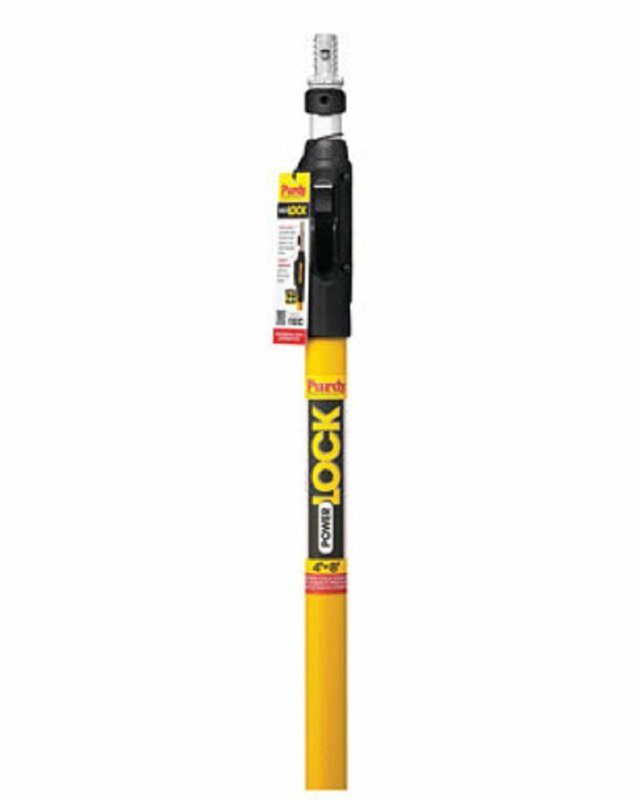 If you’re cutting in large walls this is your best friend… I used this guy to cut in my entire house. Although I suppose I should say I used this gal to cut in my entire house because the xl dale is our number one brush for ladies. Mainly because the handle is super skinny so it’s easy to handle… I kind of love it. This guy is completely personal preference… most people will use a roller for large walls however some painters would rather use a large wall brush. To each his own I say! 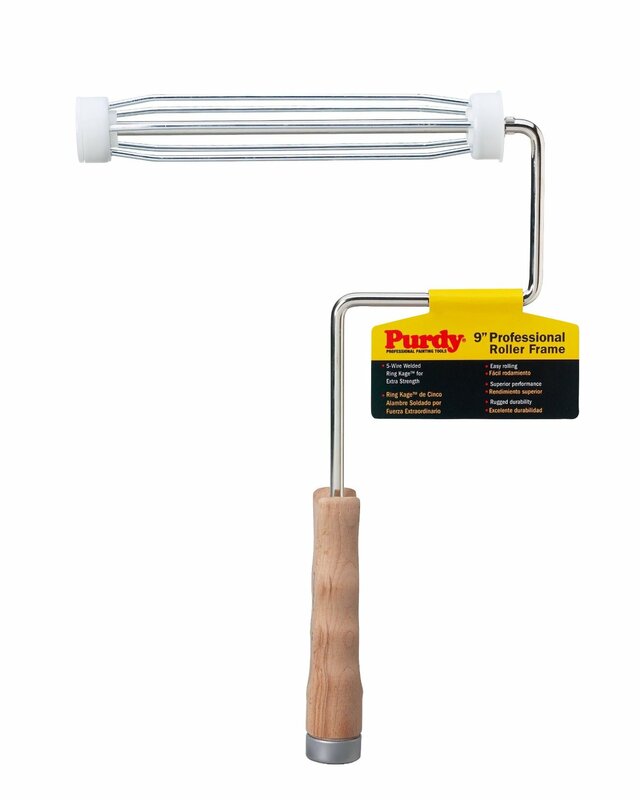 I love purdy roller handles… they’re such great quality! I love this little wooden handle roller and I also love the revolution frame… you can’t go wrong with either of these bad boys. If you take care of them (cleaning them out after each use) they’ll last for years! 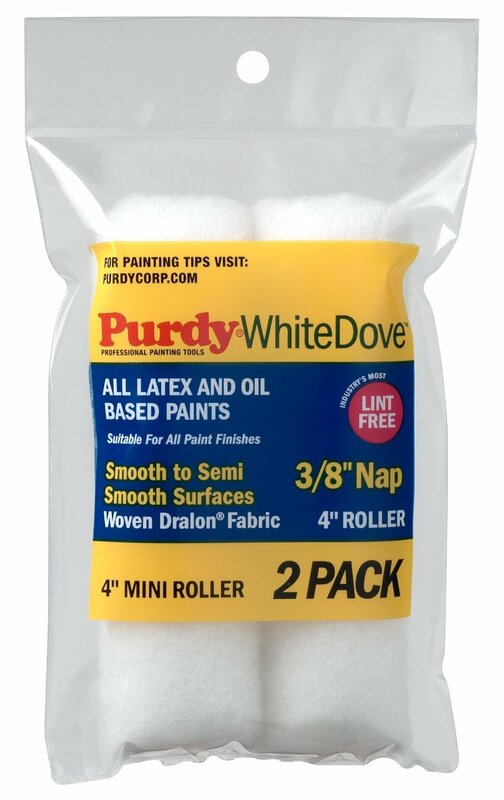 If you’re painting a smooth surface (drywall, paneling, anything else smooth…) then I love these white dove rollers. 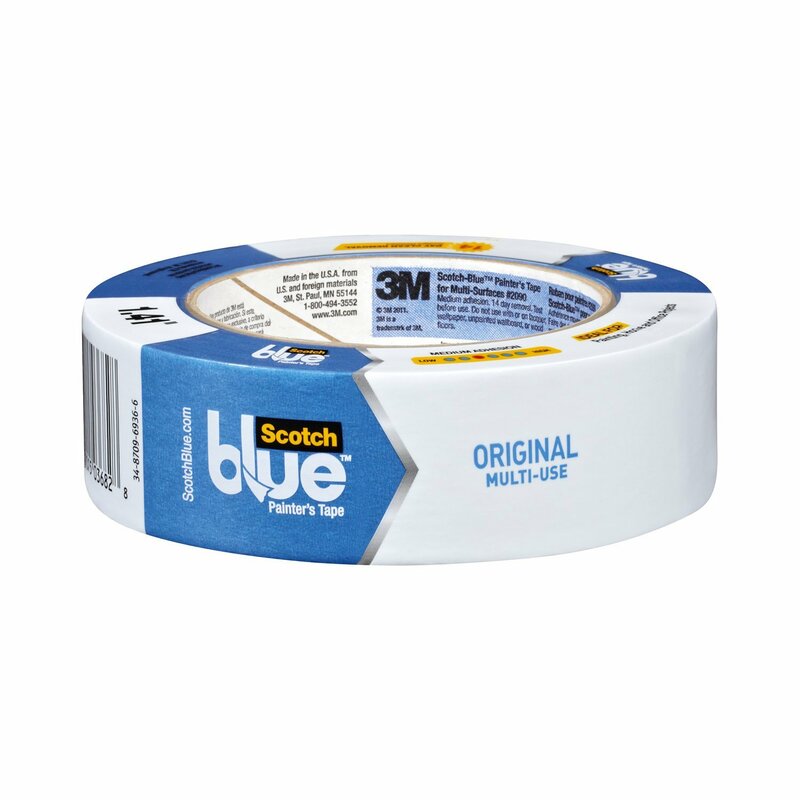 They leave a smooth finish with no linty mess… we used two to roll our entire house! Clean them out after each use and you’re golden for many paint jobs to come. 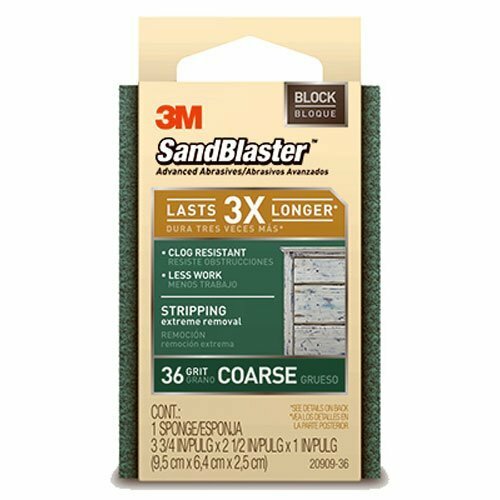 These bad boys are perfect for textured surfaces like popcorn ceilings… or getting down in the groves of a wooden deck. If you’re trying to roll a smaller space a 4 inch roller might be just the ticket… especially for smaller projects like bookshelves! These little guys are the bomb. Here’s a little trick for shorties like me (okay I’m 5’6 so I’m not exactly a shrimp but next to my 6’4 hubby I feel like a shrimp). 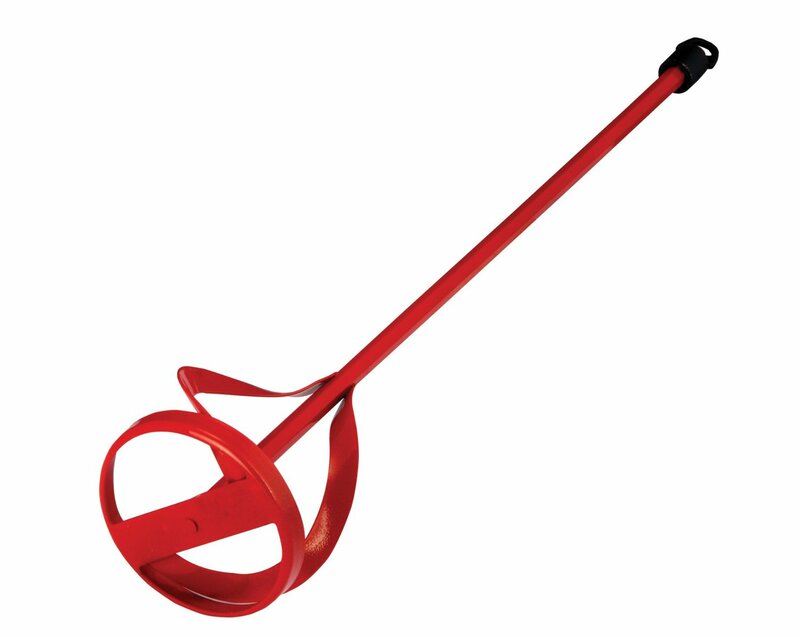 This little guy will save you a bit of ladder work… all of that up and down can be killer after a long day. 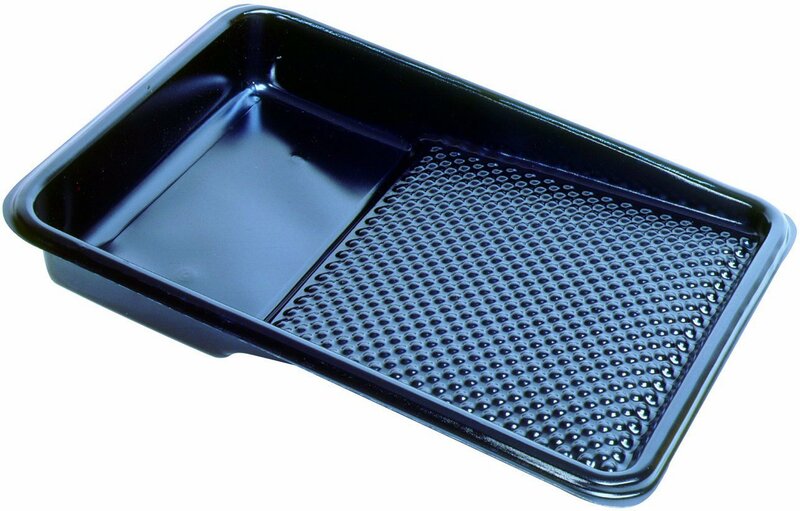 If you’re a frequent painter a metal tray can be a great investment… just switch out liners for each new project! When you’re done throw the liner away and you’re good to go for the next project… awesome. Liners are pretty self explanatory but they’re not all created equal. Look for ones with these little bumps… they really help load your roller with the perfect amount of paint. 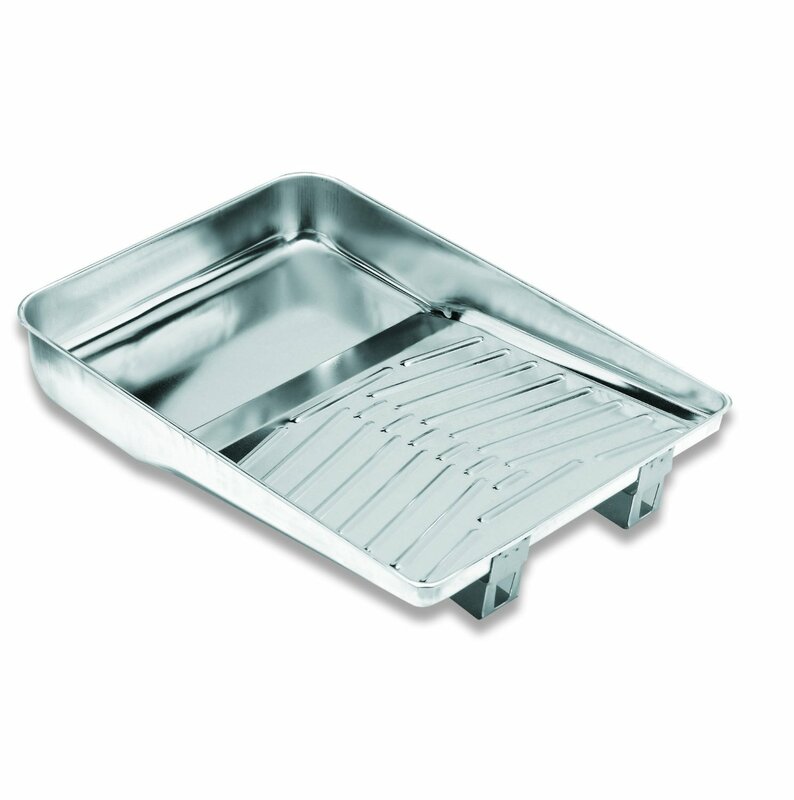 If you’re only painting one room or you just don’t want to buy a metal tray these little one time use pans are perfect. 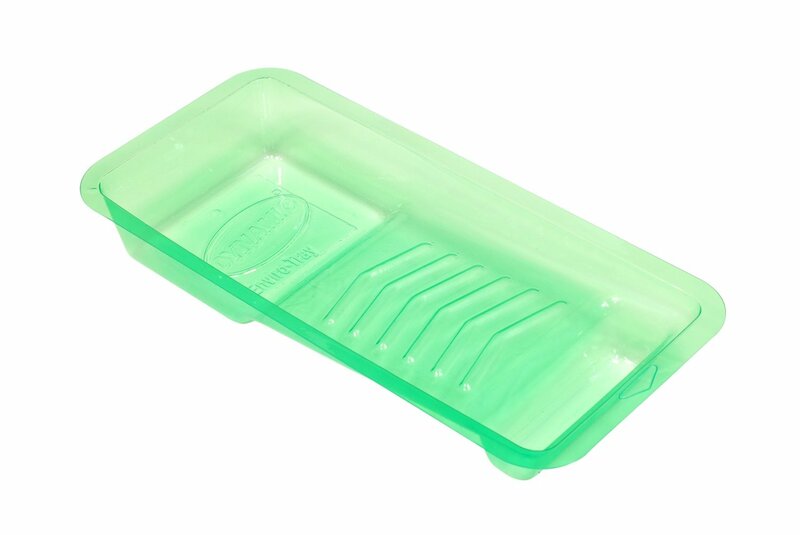 They’re sturdy enough to stand on their own but are plastic… so you can toss it when you’re done! Who needs to spend hours cleaning out a pan anyways? 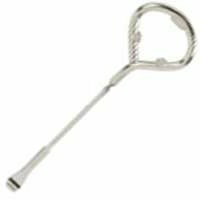 This little guy might just be my favorite invention ever… he’s even on my short list favorite supplies! With a red rubbery base paint peels right out (I don’t know why they even make liners for this guy you don’t need them) and a magnet holds your brush in place for climbing up and down ladders to cut in the ceiling. He’s the perfect little paint pal. 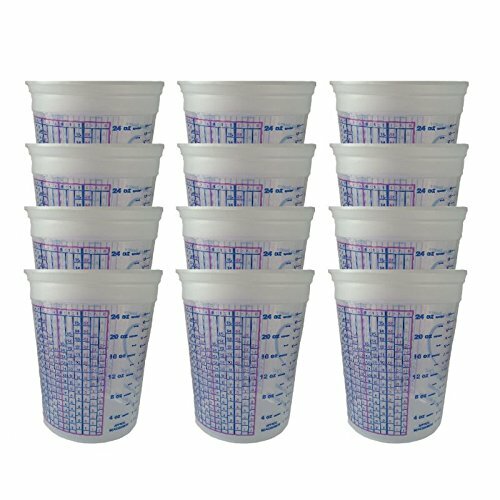 Of course if you don’t want to spring for a paint pal these little plastic measuring cups work just fine… although I love them for mixing chalk paint. The measuring marks on the side make it super easy to mix paint and plaster of paris. These little can clips stick right to the edge of your paint can and hold your brush over the open can… so you don’t have to worry about drips. Honestly what will they think of next? Ready to spring for the next best thing? 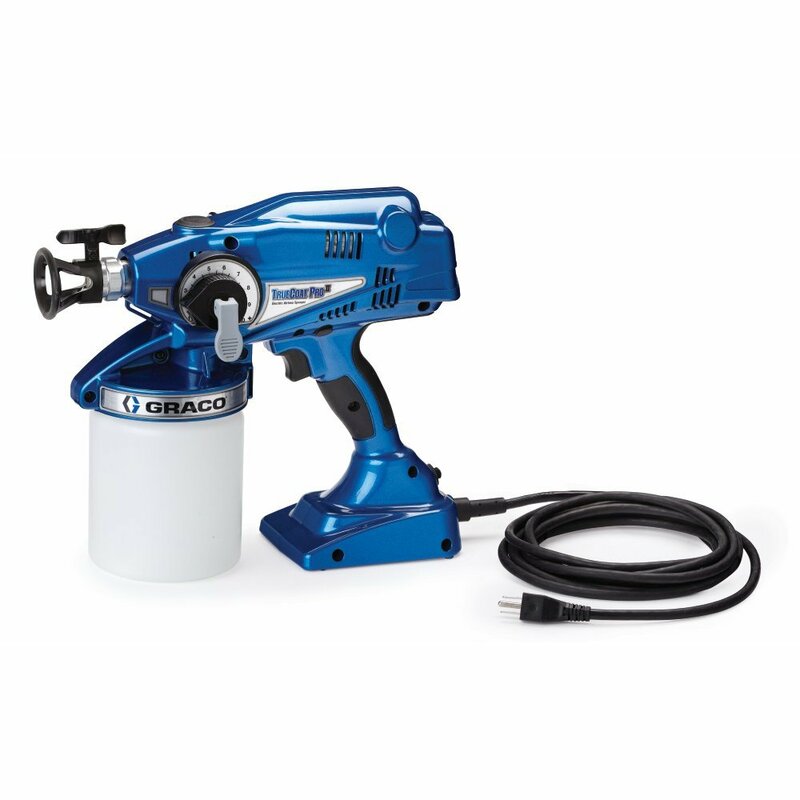 This little cup sprayer from Graco will work for walls, furniture and all types of little projects. I am dying to get my hands on one… I used one at our last assistant manager’s meeting and they. are. awesome. The last time I painted our bedroom our little black cat Jasper ran right through our paint tray and out into the hall… leaving little sea foam kitty paw prints as he went. Just buy a drop cloth. Trust me. 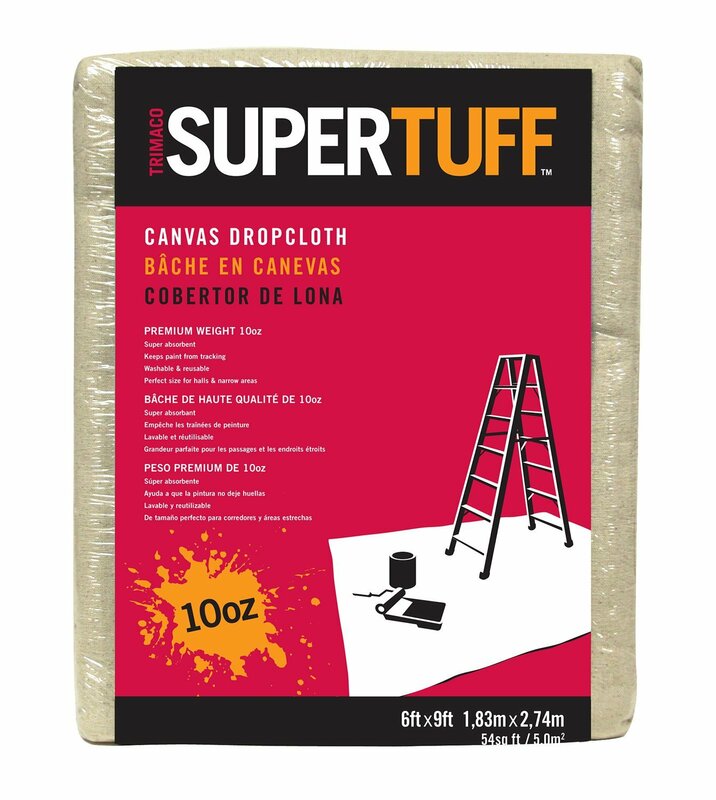 If you don’t need a canvas drop cloth go ahead and spring for a plastic one… they’re disposable and not expensive so you can toss it when you’re done. 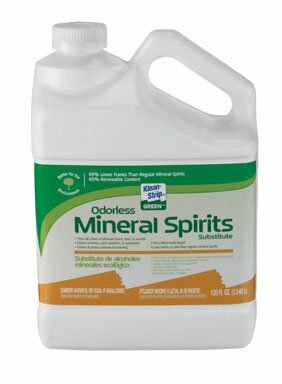 If you’re working with oil based paint mineral spirits is a must! You’ll need it to clean your brushes! If you’re unsure whether you need mineral spirits or paint thinner here’s the trick: they’re the same thing! Basically there are technical differences that you don’t need to worry about… both will work perfectly for cleaning oil based paints! 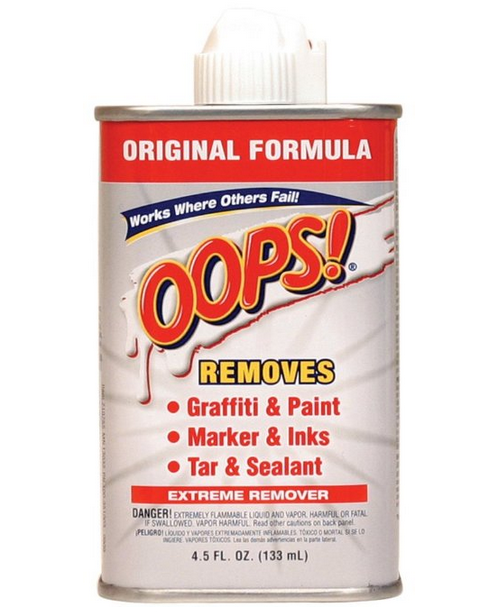 I love oops for so many reasons: it can clean your hands, it can take adhesive off a wall or glass, it can remove paint from tile and most importantly it can help you tell if your paint is latex or oil! Before starting a painting project the first question you should always ask is “is my paint latex or oil”. Oil will go over anything… but it’s a big pain in the rear to work with. Latex will NOT go over oil… if you try it will literally peel right off! Of course sometimes you’re unsure of which type of paint is on your walls… especially if you weren’t the one to paint in the first place! So here’s a little tip: put a bit of Oops on a cotton ball and rub the cotton ball on your wall. If the paint is oil based the oops will simply clean your wall. However if your paint is latex based the oops will transfer onto the cotton ball! If you’re ready to clean out your brushes this little guy will help get your brushes super clean! If you’re looking for an easy way to clean those roller’s this little guy is awesome. One of my painters once told me the easiest way to clean out a roller was to spin that baby under a water hose… and then run this little roller comb up and down the roller. It will truly take the paint right out of your roller! I always have the hardest time getting my rollers clean (I’ve made that the hubby’s job) but this little guy makes it super easy. 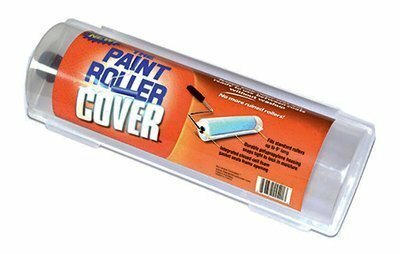 With roller covers costing $8 dollars a pop you want them to last as long as possible… painters will use the same roller day in and day out for months and this little guy is the secret. 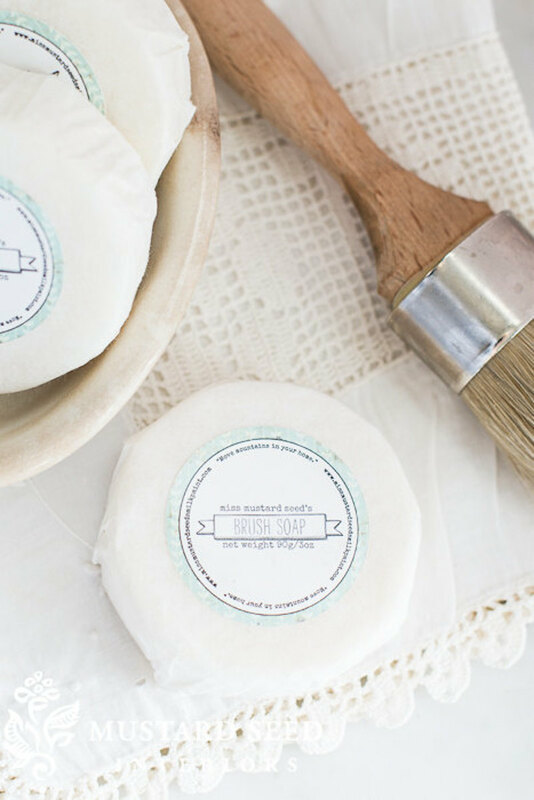 So technically Miss Mustard Seed’s Brush Soap is designed to work seamlessly with her amazing milk paint (which is a whole different topic) but here’s a little tip… it works on latex. 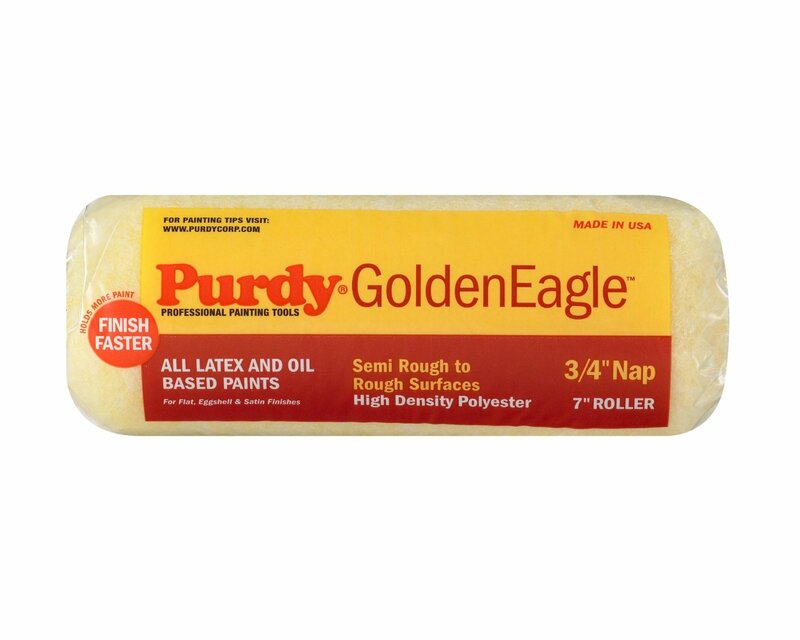 I love cleaning my brushes with this soap after painting walls, painting small projects, painting furniture pieces. Every once in a while you run into a night when you need to put your brush away but you’re not done painting! Maybe you’re painting a second coat the next day, maybe you’re just tired and want to go to sleep! Who knows… either way these little guys are life savers. 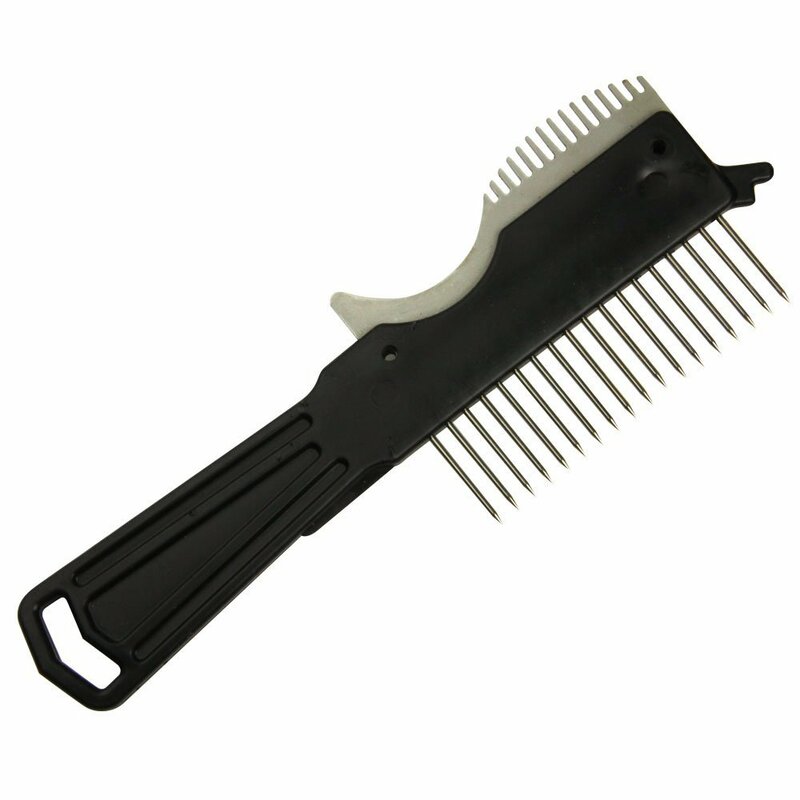 Mom use to teach me to put my brush in a baggy and then put the whole shebang into the freezer… this is so much easier. They will totally keep your brush or roller wet and ready to use until the next day… isn’t that cool? I really want to do an experiment with these guys to see exactly how long they’ll keep… I’ll keep you posted! Of course if you’re completely overwhelmed with all of the options feel free to snag your very own checklist… I’ve made it printable for you! Looking for the perfect paint color? In several minutes a day I'll guide you from swatches to done in 6 days.